A daydream in powdery pink and soft violet, Arianne gracefully channels the essence of love. 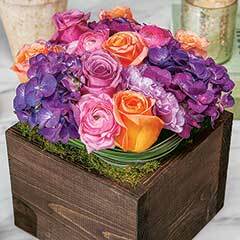 Arranged with perfect clusters of sage buds, majestic fern tendrils, and lively shoots of vegetation in a dark stained hand crafted wood box, Arianne measures approximately 7" x 7" x 9" to top of arrangement and requires next day shipping. 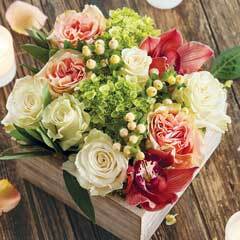 Arianne is a fresh cut floral arrangement. Arianne is rated 4.3 out of 5 by 16. Rated 2 out of 5 by Darci from Nice idea, poor execution. I wouldn’t buy this again. The roses were not fresh and were droopy and starting to brown when they arrived. Rated 5 out of 5 by Snowwhite from Amazing flowers The flowers look exactly as pictured. Best find is this company. It never disappoints. Rated 3 out of 5 by Frank from Not as pictured. 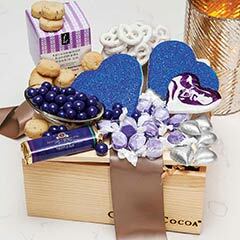 Nice arrangement, but not the quality I've purchased from Olive and Cocoa before. Rated 5 out of 5 by Dee1616 from Simply Gorgeous! I sent this to my mom for her 92nd birthday. She absolutely LOVED IT! She even let me know that it lasted for such a long time to keep her home smelling good and with such a beautiful arrangement in her entertainment area. Thank you. Rated 5 out of 5 by CB 44 from Happy Recipients! My friend said she had seen the catalog and thought about ordering but never had. 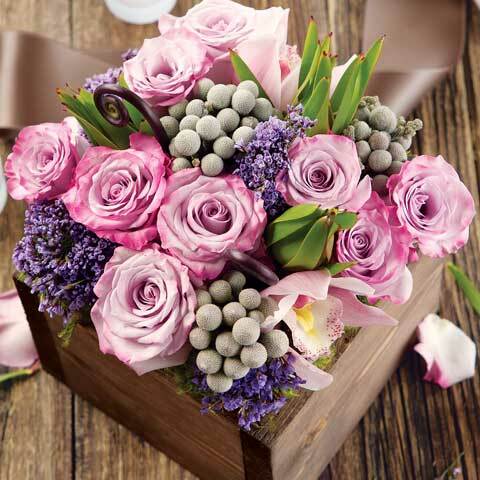 After seeing the lush blooms and pretty presentation, she is going to order too! 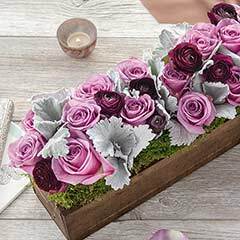 Rated 5 out of 5 by Pam3 from Beautiful Arrangement This company does an outstanding job of customer service and also delivers the most beautiful flower arrangements!!! I order from them all the time and if something is not correct they really go out of their way to correct the issue! Thank you!